New Delhi : The Prime Minister Narendra Modi on Sunday met leaders of central trade unions and heard their views on economic policy and labour laws, On the eve of the 46th Indian Labour Conference Here. The Prime Minister’s meeting followed an extensive consultations which the trade union leaders held with an inter-ministerial panel headed by Finance Minister Arun Jaitley. Emerging out of the meeting, trade union leaders said that the Prime Minister had not given any assurance and hence they would go ahead with their September 2 nation-wide strike in support of their 12-point charter of demands. “The Prime Minister heard the views of the trade union leaders on various issues of interest to workers, including in areas related to economic policy, and related laws,” an official statement said. Modi will inaugurate the Indian Labour Conference on Monday. Jaitley will the guest of honour. 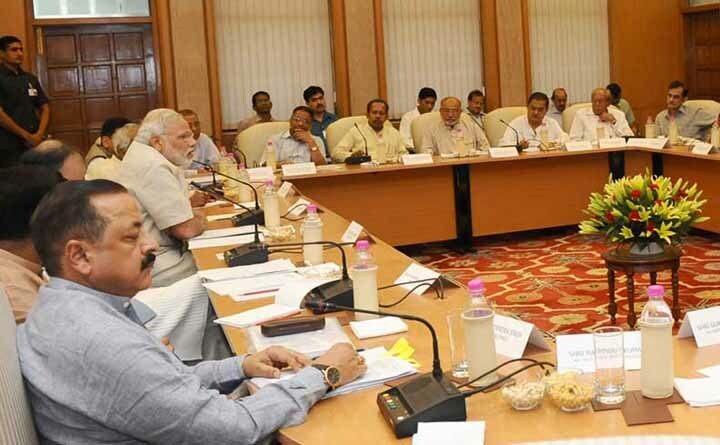 Besides the union leaders, the tea meeting hosted by Modi was also attended by the inter-ministerial panel members Jaitley, Labour Minister Bandaru Dattatreya, Petroleum Minister Dharmendra Pradhan, Power Minister Piyush Goyal and Minister of State in PMO Jitendra Singh. There is no assurance or anything from them. Therefore our stand for strike on September 2 stands. All trade unions are unanimous on this and will remain united.” Dasgupta said trade unions would oppose disinvestment and the government’s move to change labour laws as it would hurt the interest of workers. Echoing similar sentiments, Centre of Indian Trade Unions (CITU) general secretary Tapan Sen said that the trade unions would oppose changes in labour laws and other anti-worker policies of the government. “The labour law amendments of the government will impose slavery on workers,” Sen added.